What do you get when you mix a boxing coach, a brick layer, and a school teacher? Fun driving blues from Canada. 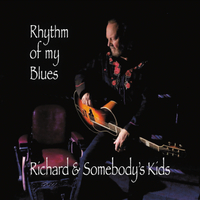 Richard & Somebody's Kids is an easy going Canadian band that plays fun, original, bluesy music. This is storytelling with a twist! The rocky blues licks and Texas slide guitar swing with a driving keyboard bass, and the filling sound of 70's and '80's Hammond organ. With the influence of americana, country, and folk, this unique band has a little something for everyone.